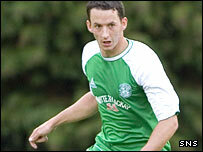 Hibernian midfielder Guillaume Beuzelin is closing in on a first team return after a 10-month injury lay-off. The 27-year-old playmaker has been sidelined since sustaining cruciate knee damage in the 2-2 draw at Kilmarnock in January. He played in a reserves match last week and is set to feature against St Mirren's reserves on Tuesday. The Frenchman could make his first team return against Kilmarnock at Easter Road on 4 November.